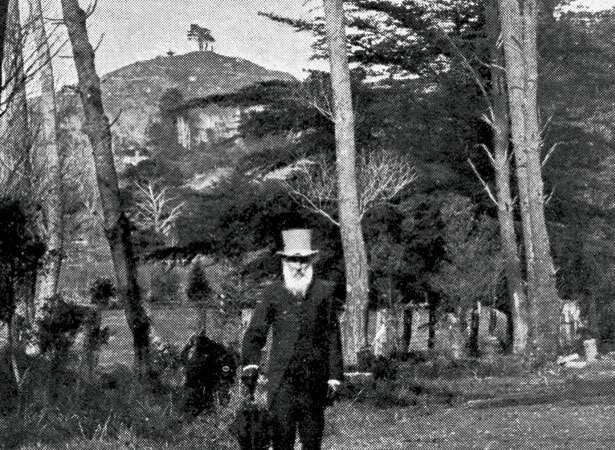 At a civic reception for the Duke and Duchess of Cornwall and York, John Logan Campbell handed over the deed to land around One Tree Hill/Maungakiekie. The new park was named in honour of the royal couple. The Duke and Duchess, later King George V and Queen Mary, were touring the Empire to express gratitude for the support given to Britain during the South African War. During their visit to New Zealand, Campbell, a prominent Auckland merchant, was asked to be city’s honorary mayor. In response, he donated his country estate to the people of Auckland, and asked it be named Cornwall Park. In the centre of the park is a volcanic cone, which Māori called Maungakiekie – mountain of the kiekie (a climbing plant). The site of a pre-European pā, Pākehā dubbed it One Tree Hill after a solitary tree that grew on the summit when Europeans first settled Auckland. An obelisk built during the 1940 Centennial as a memorial to Māori still stands. Campbell is buried beside the obelisk at the summit. We have 1 biography, related to Cornwall Park gifted to Auckland.